Weekends are now sunnier for British players at Conquer Casino. 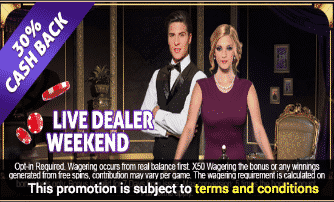 Get your Cashback of 30% on aggregated losses up to £300 on Live Dealer Roulette. To claim this offer, you simply have to log into your account and make a deposit of more than £10 using the code CASH. Wager the bonus 50 times before making a withdrawal. Level up your gambling skills with this amazing deal and have a lot of fun playing Live Roulette!